A reliable source has exposed shocking reasons behind the judicial rascality of Justice John Tsoho on March 7, 2016, in which he surprisingly overturned his previous ruling in favour of the request by the Nigerian government to conduct a masquerade/secret trial for Nnamdi Kanu in an alleged treasonable offence case brought forward by the Nigerian government. The Judge presiding over Nnamdi Kanu's case on February 19, 2016 had ruled against the request for a secret trial tabled by the federal government. However, during the next court sitting on March 7, Judge Tsoho, upon a repeated request by the Prosecuting Counsel, surprisingly back-tracked and approved the masking of witnesses and restriction of public presence during the course of the trial. 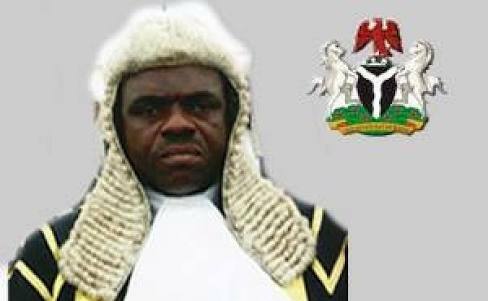 Justice Tsoho's ruling has since continued to generate a wide range of controversies both locally and internationally, even as Nnamdi Kanu and his co-defendants, Benjamin Madubugwu and David Nwawusi has openly accused the High Court Judge of being biased, prompting his automatic resignation from presiding over the trial on September 26, 2016. Several human rights groups also joined in the condemnation of Tsoho approval for a masquerade trial as it is an affront to democracy and human rights treaties signed by Nigeria as a member of several international organisations. However a reliable source which pleaded anonymity has revealed that Justice Tsoho was forced by the federal government through their DSS henchmen to conduct a secret trial for Nnamdi Kanu, as the federal government lacked veritable evidences and witnesses to try the IPOB leader on the trumped up charges leveled against him and his co-defendants. It alleged that the DSS had threatened that if Tsoho fails to give room for a secret trial, "they have veritable evidences indicting him of multiple corruption practices as a judge, which would be enough to ensure that he ends up in jail". "Justice Tsoho didn't just commit that judicial blunder willingly- he was actually subjected to intense pressures by the federal government through the DSS. This is what led to his turn around, in favour of the request by the federal government seeking for masking of witnesses or secret trial as you call it," the source revealed while speaking with Family Writers in a telephone interview. "Same way Rotimi Chibuike Amaechi told a judge that his Oga Buhari is not happy with him over his refusal to rule in favour of APC, is exactly how DSS confronted Justice Tsoho that the Presidency is annoyed over his earlier ruling against a masquerade trial for Nnamdi Kanu. "So he was left with fewer options than to comply and be granted a Presidential immunity." it stated. Justice Tsoho who resigned after series of accusations and petitions were leveled against him based on the biased handling of Nnamdi Kanu's case, has been replaced with another judge, Binta Nyako to continue with the trial. Justice Nyako has slated November 8, 2016, for a first hearing of the case; a date which clashes with the day the Ecowas Court is due to deliver a final judgment based on the suit filed by Nnamdi Kanu against the Nigerian government over his illegal detention and abuse of his fundamental human rights.